-Relab 480 and VSR24 (and waiting for P4N). Depends on what you want: effect or room-simulation. In my productions I need convincing rooms and I prefer the Lexicon PCM and/or Altiverb. @Iggy, I'm the opposite from you, lol. I usually get along well with most halls but can't for the life of me find a good room reverb. They always cause that ugly phasing thing. It's weird that we get hung up on that one particular sound and can't deal with anything that deviates from it. It's weirder that, with all the choices out there, we can't find the one decent sound that works. I'm still hung up on the fact that Lexicon PCM doesn't work ... because it's Lexicon! How could it not work? But somehow, it doesn't, not for me. Valhalla verbs, except for orchestral stuff then Phoenixverb and other from exponential audio. I have found Altiverb very nice but it doesn't get out of the way like Phoenixverb. Valhalla is pretty wet. a good sounding wet not the generic wet. pretty good for use on electronic music (Padz, Padz & Padz). ArtsAcoustic for orchestral compositions and REDline (MY love) for everything else. all has been said but still its fun to talk about reverbs! maybe its worth mentioning that using predelay makes more realistic spaces. early reflections come first- giving you the sense for the room, then after the predelay the reverb kicks in. 50 to 120 ms is good. for fx you dont really need predelay. also distorting the reverb can be cool! also why is this tread still a thing? So, after three and a half years and nearly four hundred replies later, I'm still not telling you what MY favourite reverb is. For Pop/Urban vss3 is flipping awesome on drums, replaced my Lex's. However Lex is still king on Vocals. For classical.orchestral B2 is amazing. Really want to try the Relab stuff. you sick individual, why do you torture us like that? StereoRoom and Blackhole are both awesome plugins. This is exactly what I've done lately to create the illusion of depth. It's pretty convincing, and really opened up my mixes providing more detail and clarity as well (which was an unexpected surprise). I also adjusted tail volume thinking if the source is closer to you, you hear less of that in relation to the dry. I use the idea of 1ms = ~1 foot when making adjustments. For a rock band mix, I decided to use three different zones (room, room closer, room closest) and varied the predelay by ~2ms in each zone. Then just send the tracks to their appropriate "spaces". Using the same room in each three instances "glues" things together really well. 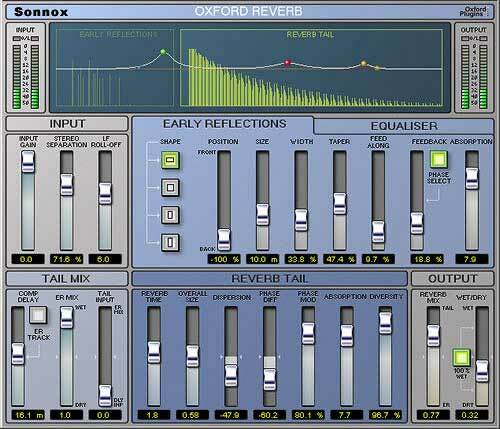 I see in some online tutorials that others create this depth by using different reverbs altogether and delays. I wanted a sense of cohesiveness so I used the same room. It's surprising what happened to the sound given that the only differences were the 2ms difference between the zones and the tail volume adjustments. This is exactly what I've done lately to create the illusion of depth. It's pretty convincing, and really opened up my mixes providing more detail and clarity as well (which was an unexpected surprise).